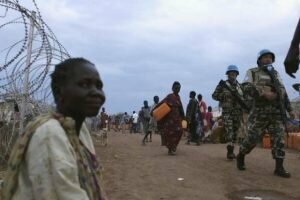 Juba, May 7, 2017 (SSNA) — The United Nations Mission in South Sudan (UNMISS) has deployed peacekeepers to Upper Nile’s Aburoc to help enable the delivery of humanitarian aid to tens of thousands of people who fled their homes due to ongoing civil war, UN Mission in South Sudan said today. “The aim is to provide humanitarian groups with the confidence they need to resume the provision of urgent assistance to tens of thousands of people in Aburoc who are fleeing the ongoing violence. This short-term deployment is a response to an immediate need and will provide a light and temporary peacekeeping footprint in the area,” Shearer said in a statement. Shearer warns of possibility of an outbreak of diarrhea or cholera if safe water not delivery to up to 50,000 vulnerable civilians living in and around Aburoc. “Without a secure supply of clean water, there is a risk of an outbreak of diarrhea or even cholera which has the potential to kill thousands of vulnerable people. It is vital that our humanitarian partners are able to get this water and other aid through to alleviate the suffering,” he said. Shearer disclosed that UN Mine Action Service is in the affected area to check the main road between Kodok and Aburoc for old landmines. He also said UN is considering providing protection for trucks delivering water. To starve civilians by blocking food delivery, is a crime against humanity. It is equivalent to killing them indirectly. I as a South Sudanese,would like to appreciate the efforts of assistance the UN and any other humanitarian organization, are offering to our really suffering people.